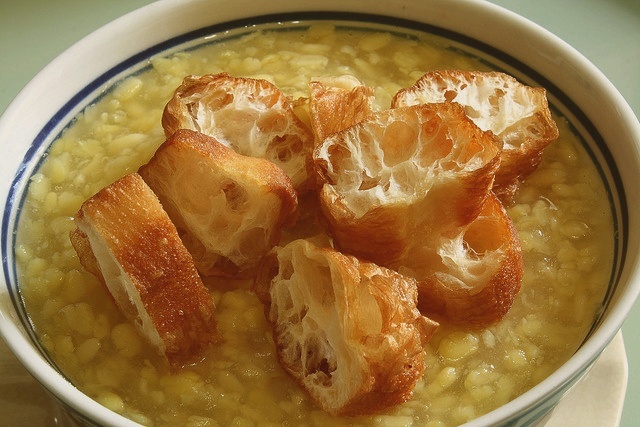 Tau suan is a simple sweet Chinese dessert made of split mung beans. Follow this Singapore Hawker Style recipe from Makansutraweb. Recipe by Seetoh. Heat the pot, add in 1.5 litres of water and pandan leaves. Let it boil for about 10 minutes. In a meantime, dry fry mung beans in a wok, add 2-3 dsp of sugar to caramelize and brown them a little. This will firm up the beans, when you soften and boil them later in the syrup. Remove the pandan leaves from the pot, transfer the beans over and boil for another 5-7 minutes. After 5-7 minutes, add sugar according to your taste. Stir. Mix the water chestnut and potato flour together. Add some water to make starch. Lower the heat and thicken the Tau Suan syrup by slowly adding the starch to the pot (to your desired thickness), and stir gently. Turn off heat. To serve, fill dessert bowl with the Tau Suan and top some chopped you tiao over it. Serve hot.